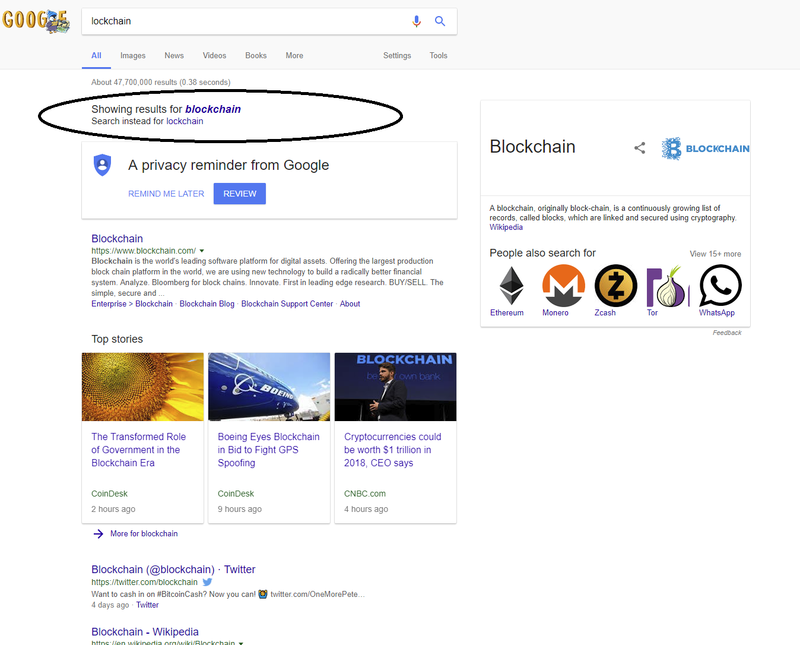 The LockChain domain name has continuously been acknowledged by Google’s search AI as a typo of the search term “blockchain”. This has specifically been a shortcoming for new-coming people that try to research the brand. This is so, because if they are not careful, they might be left with the impression that there is no information about LockChain due to the irrelevant results which Google will display. What usually happens when someone types “LockChain” as a standalone search keyword, is that the results are automatically diverted to the results for the search term “BlockChain” (see below example). You will notice that the results are auto changed to “blockchain” and our site doesn’t appear, and neither any of the our social posts, accounts, external posts by media, blogs etc. This is why it has been discussed with our community that it might be a strategic move to make a re-branding/change of domain to a more catchy name, which at the same time does not conflict with auto suggested terms. The process of migration from one domain name to another is done via the so-called “301 redirect’. This SEO setting is used to forward all traffic and domain/site ranking authority to the new address. The result is zero loss of traffic and when people land on the old address, they will immediately be transferred to the new corresponding ones. Such an example is the second domain name we own — “Chainlock.co”. Feel free to click on that domain to see what the effect is from a user experience. You will immediately be forwarded to Lockchain.co. In general, domain migration is a completely manageable, quick and painless process from a technical point of view. However what should be kept in mind that after such a migration, is that in case someone types the new brand, he will see the new site straight up, but will not see the external posts that are linking to the old site. This includes user generated reviews, media posts, blogs, tweets etc, because they will all be trigerred by the “LockChain” term and not the new brand. The good: We will show straight up for the new brand, anyone who lands on the old domain will automatically be forwarded to the new one. We can pick a more catchy name that will still make a reference to the old one. Containing “loc” or “lock” in it to make sure there is a strong connection with the token “LOC” that is cicrulating and which can not be changed. The bad: There will be less additional posts showing up for the “exact match” brand search, since we can’t change the posts that have been made throughout the tokensale campaign. This will affect new-coming users which are not aware of the previous brand. Important: Most of the external posts at the moment are in the context of the tokensale/ICO and not to the retail service. This is also an important factor to take into consideration, since the retail service is much more important and will be the one to stay in focus in the long term. The ICO has been completed successfully, and with our great community, once the service is retail ready, we should be able to quickly offset any “lost” external posts. Also Important: If your only concern is the google auto-suggestion, then keep in mind that there is some chance for the domain brand to be recognized after we complete our Google Plus registration and company address verification. This takes approximately 1 month, since Google does send out a postcard to the physical address of the business to verify its address. NB! The Vote is ONLY for the brand name lockchain.co and NOT for the tokens. The tokens are deployed in the blockchain and can never be changed/renamed. They will stay “LOC”. Please give us your vote. If the vote is for “yes” we will run a second vote where we will provide 4–5 carefully picked domain suggestions (we already selected those, so the second vote will be relatively quick). If the vote is “no” we will continue to operate with the brand LockChain.co . With the increase in traffic and trust in the domain, Google will eventually recognize the domain as a brand and not as a typo. Your vote is important for us. In order to vote, you should login with your google account (in order to prevent multiple votes per person). The vote is anonymous and we will not use your email will not be collected. We will require a minimum of 500 votes on this, since it is an imporant one. In case the quorum is not met, we will keep the current domain.